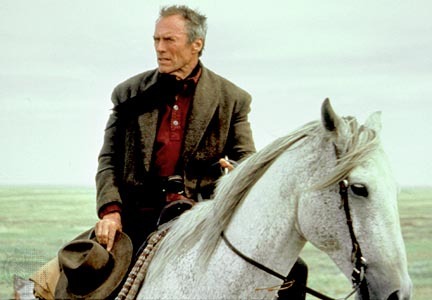 The first western to win the Academy Award for Best Picture (or any Academy Award, for that matter), and the last for 60 years until 1990’s Dances With Wolves. 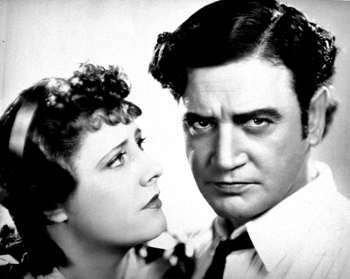 By modern standards, this epic based on Edna Ferber’s 1929 best-seller seems dated: the quality of the sound in the early days of talkies was not great; long-haired leading man Richard Dix, playing Yancey Cravat, has the looks and dramatic style of an earlier sort of matinee idol (reminiscent of Francis X. Bushman); and the existing print (as shown on TCM, which has pretty high standards generally) is not in great shape. The racial attitudes may make modern audiences cringe, but if you watch carefully, you realize that is one of the points the movie is making. So its social attitudes would be progressive for its time. Irene Dunne, in one of her earlier starring roles (just her second movie, in fact) as Yancey’s wife Sabra, is quite watchable still. Edna May Oliver is Mrs. Tracy Wyatt, embodying prissy attitudes of the more respectable parts of the community in quasi-comic form. She’s the most memorable of the supporting cast, just as she was in Drums Along the Mohawk.. Handsome lawyer-newspaper editor Yancey Cravat is afflicted with wanderlust, which takes him away from his young family in Wichita to become one of the Oklahoma Sooners in the land rush of 1889. 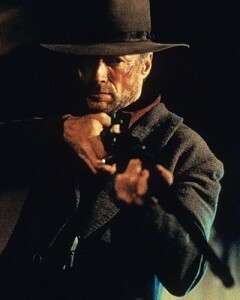 He has some kind of mysterious background on the range, and is good with guns, of which he wears two. 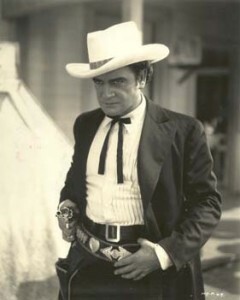 His friends include the outlaws led by the Kid (William Collier, Jr.). When he loses out on the quarter-section of land he wanted due to the good-natured trickery of a lady of easy virtue, he returns to Wichita and brings his wife Sabra and four-year-old son Cim to the new town of Osage, Oklahoma, where he becomes a community leader by his guns and his newspaper. 1889: The Land Rush is on! 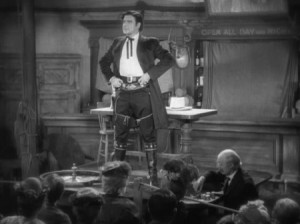 In Osage he shoots it out with undesirables, including Lon Yountis (Stanley Fields) and eventually with the Kid and his gang. He advocates and embodies progressive social attitudes, befriending a Jewish peddler and Dixie Lee (played by Estelle Taylor, Jack Dempsey’s former wife), the young woman with a lurid past who beat him to the land he wanted. Just as his family is becoming prosperous in 1893, Yancey disappears to join yet another land rush to the new Cherokee Strip farther west, and his family doesn’t hear from him for five years. Sabra runs the newspaper he founded, the Oklahoma Wigwam (cringe again), and does well. Yancey reappears in 1898 in the uniform of a Rough Rider, just in time to defend Dixie Lee in court from charges brought by, among others, Sabra. Dixie Lee is acquitted. Yancey stays until statehood and has dreams of running for governor when Oklahoma reaches statehood in 1907, which are scotched when he publishes an editorial advocating rights for Indians. When Cim wants to marry an Osage Indian, Sabra is horrified but Yancey sides with Cim. He soon disappears again, more or less for good this time. Sabra hears rumors of him being spotted in the fighting in World War I at Chateau Thierry, although he would have been close to 60 at the time. She keeps his name on the masthead as editor and publisher, and time vindicates many of his social stands. Sabra prospers on her own and in 1929 is herself elected to Congress. After a party celebrating her new status, she is touring a new oil field when an accident to an old worker (Ol’ Yance, he’s called) leaves him dying in the mud. It is indeed a bearded Yancey, and it’s not clear why he never came home again even though it seems like Sabra would have welcomed him. He dies in her arms. The movie ends with that, and she presumably goes off to Congress. Yes, it now seems old-fashioned, both the story and the manner of its presentation. But it’s still a good story and is quite watchable, although seldom seen these days. It’s long for its time, at more than two hours (131 minutes, to be exact). Spanning more than 40 years, it gives its actors the opportunity to play their characters at different ages. Dunne does it best, partly because Yancey isn’t around to age much. Irene Dunne received a Best Actress nomination for her work here, the first of five nominations for her. 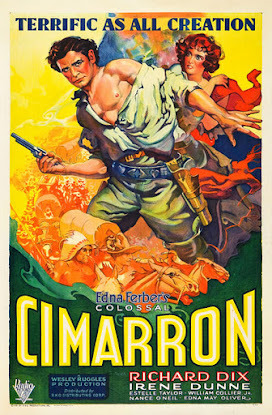 Cimarron was remade in color almost 30 years later with Glenn Ford and Maria Schell in the principal roles; the remake doesn’t work quite as well as this original. 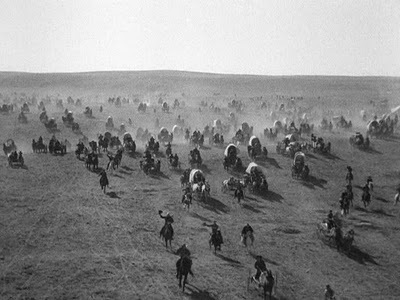 Some of the Oklahoma land rush story was told again in Ron Howard’s Far and Away of 1992. Supposedly the Yancey character is based on Sam Houston’s gun-toting lawyer son Temple Houston. One of the extras was Nino Cochise, a grandson of the famous Apache chief, along with his friend Apache Bill Russell. The land rush scene took a week to film, using 5,000 extras, 28 cameramen, 6 still photographers and 27 camera assistants. The movie lost $565,000 on a budget of $1.433 million. It was re-released in 1935 and the red ink mostly disappeared off RKO’s books. In black and white, except for the posters–those are in vivid color. The movie might be more than 80 years old now, but those are really great posters (see above). 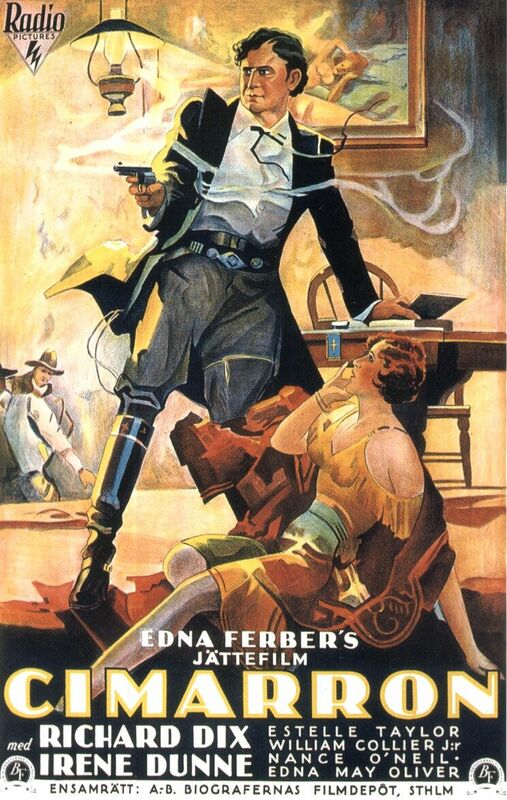 This entry was posted in Westerns Worth Watching and tagged Oscar Winners, Western Epics on December 14, 2013 by Nicholas Chennault. 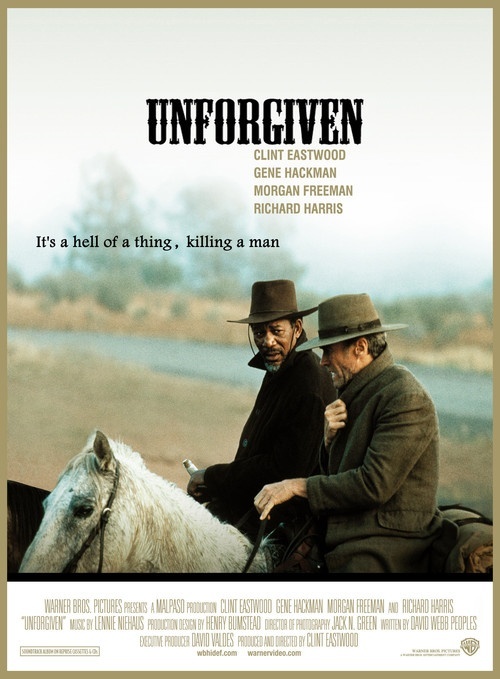 This is the other western Best Picture Oscar winner from the early 1990s, one of the seven Academy Awards it won. It also won a Best Director Oscar for star and director Kevin Costner. It was a breath of fresh air when released, but over time it hasn’t worn as well as some others. Unforgiven, for example, is as hard and bracing now as when it was released. But perhaps Dances With Wolves depended for its initial effect on ideas new at the time, which are no longer quite so new. 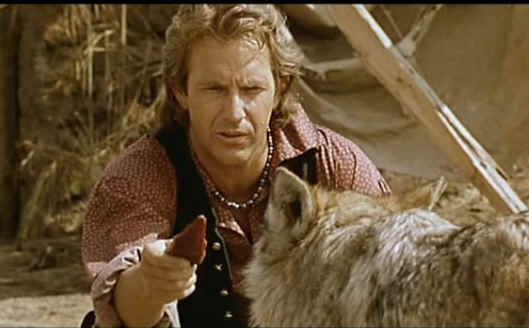 The principal character is Lt. John Dunbar (Kevin Costner), a badly-wounded Civil War hero sent to be the sole occupant of a frontier outpost on the plains. He fixes up the modest post and tries to learn about the country and its native inhabitants—a band of Lakota Sioux and a wolf who finds Dunbar intriguing. Gingerly getting to know them bit by bit, he gradually becomes one of them in his way, even forming a relationship with a white woman (Mary McDonnell) who was captured by the Indians so long ago she barely speaks any English. The Indians go from being inscrutable and savage “others” to being real characters with different personalities as Dunbar gets to know them. This idyllic existence is only sullied by the eventual return of other soldiers to the post. Unlike Dunbar, these other whites are completely nasty and unsympathetic, and Dunbar sides with the Sioux against them. There are excellent performances in this film, including Costner’s, McDonnell’s and especially Graham Greene as Kicking Bird, leader of the Sioux. Rodney A. Grant is good as Wind in His Hair; Mary McDonell has one of her best roles ever as Stands with a Fist. Costner basically has to carry the film, and he does a good job. The Indians speak Sioux (with English subtitles) to give the movie more realism. And they look like Indians, because most of them are. Greene is an Oneida from Canada, and Rodney A. Grant is an Omaha. These Indians are on screen a great deal and are treated with a strongly romantic sympathy, a new approach at the time. Commercially, this movie was a gamble at the time of its release, because of its genre, the way it treated Indians, its healthy $18 million budget and its unusual length. It went on to make $400 million at the box office, a very respectable figure. In its initial theatrical release, it was three hours long—unheard of in 1990. Since its release, varying extended cuts of the film have been released on video and DVD, some as long as four hours. Lurking in the background throughout the movie is our knowledge of how things are going to work out long-term. The ultimate outcome can’t be good for the Indians, no matter how much we come to like these individual Lakotas. Roger Ebert quite accurately characterized this film as a fantasy. 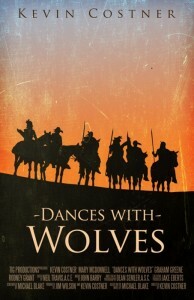 In his review he wrote, “In a sense, ‘Dances With Wolves’ is a sentimental fantasy, a ‘what if’ movie that imagines a world in which whites were genuinely interested in learning about a Native American culture that lived more closely in harmony with the natural world than any other before or since. But our knowledge of how things turned out – of how the Indians were driven from their lands by genocide and theft – casts a sad shadow over everything.” Excellently made and eminently watchable, but with a whiff of the counter-historical about it. 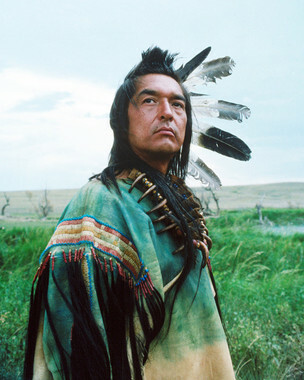 For Kicking Bird and John Dunbar, we could wish history had worked out as the film depicts, even if it is romanticized. Looking at it in retrospect, it has two problems as cinematic storytelling: First, the slow pacing sometimes seems indulgent, especially since that’s the director on which the camera focuses almost all the time. It’s slow in getting off the ground and on to its real subject, and it is admittedly a pretty long and sometimes leisurely movie. And secondly, all the Indians are so good, and all the whites other than Dunbar so unrelievedly bad, that it detracts from the overall balance and believability of the story and smacks of political correctness. In a movie this long, couldn’t there have been one more decent white character, and perhaps just a little more (accurate) Indian savagery? Still, it did start a new era of western movies, and it was the first large-scale movie to succeed in portraying Indians this sympathetically since A Man Called Horse and its sequels in the early 1970s. And for more than 20 years, until the Coen brothers’ remake of True Grit, it was the highest-grossing western in film history. This entry was posted in 55 Greatest Westerns and tagged Kevin Costner, Native Americans (Indians), Oscar Winners on August 7, 2013 by Nicholas Chennault.